StainRITE® Wright Stain Phosphate Buffer yields exceptional staining results every time when used with the Wright Stain protocol. 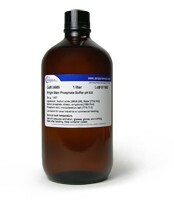 The Wright Stain protocol requires a pH 6.8 buffer to produce good quality staining. Proper buffer selection is very important in achieving good quality staining. If a buffer is too acidic the stain will be too red and nuclei will be too light; if it is too basic the stain will be too blue and cytoplasmic detail will be indistinct.